In the midst of so much insanity, it is heartening to come across a story that represents the best of the human spirit. Dignity Village, a self governing, green, urban village of about 80 homeless people in Portland, Oregon, is such a story. Dignity Village began in December of 2000 when eight people with little more than five tents and a dream came together to create a community rather than just another "tent city". Today, Dignity Village boasts of an organic farm, solar and wind power, and an elected village council that meets weekly to enforce the villages laws (i.e. no alcohol or drugs, but pets are OK). "We are deeply honored to be the first recipient of the Waking Planet World Peace Flag. Lots of us here have caught the vision and are working hard to turn things around in our lives and to turn things around in general. We are interested in finding a more sensible, equitable and sustainable way to live in harmony with each other and our mother earth," said Jack Tafari, chair of the village council. When people enter this community they sign an agreement promising to respect and care for themselves and one another. Dignity's residents are a living example of what can be accomplished when the values of connection, compassion, belonging and trust are embraced. They are a model, not only for other tent cities, but for towns and villages across the country. 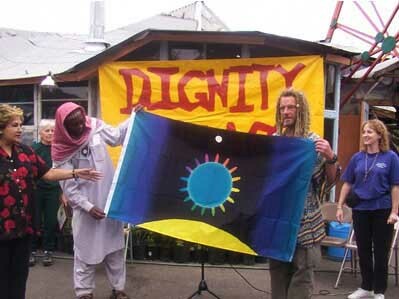 The residents of Dignity Village beautifully exemplify what the Waking Planet Peace Flag is all about. The flag symbolizes a world of harmony, peace and justice where all people are respected and valued for their inherent dignity and worth. Go to www.dignityvillage.org to find out how you can help and to www.wakingplanet.com for info on the waking planet world flag.